There were some folks that were curious about how to make prairie style mosaics like the one that was on my Box Swap submission. I’m writing this as I work on another mosaic for an extra box that was started for the swap. Hopefully this will help. For me, this isn’t a quick process. The 2 mosaics for the box swap took 50+ hours. From there I use SketchUp to make a model. The nice thing about SketchUp is that is fairly easy to become proficient at using the program without spending a lot of time learning it. Another key feature is the ability to dimension all of the parts which comes in handy when you start cutting them. 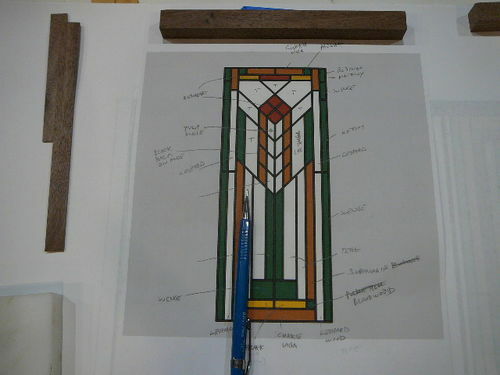 As much as possible try to size the pieces in 1/16” increments. I also use 1/16” for the spacers that go between the pieces. Making the model and setting up all of the dimensions took about 4 hours. 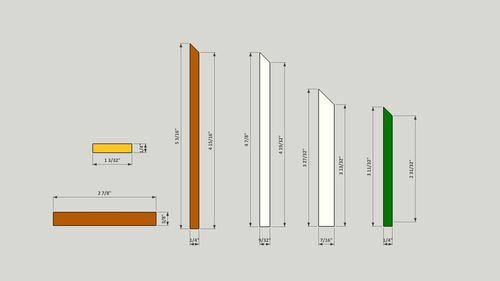 The final product is a set of dimensioned drawings that will greatly help with the cutting and assembly. My preference is to use 1/2” wood. It’s is kind of like Mama Bear, not to thick and not too thin, just right. As for selection, that is really up to you. I get exotic wood from Rockler, Bell Forest Products, Woodworker’s Source, any place that sells 1/2” pieces that are at least 3”x21”. Most places have free shipping with minimum purchase. It isn’t hard to meet the minimum purchase since exotics aren’t cheap. I tried using stains and dyes but neither one worked. There is a lot of sanding to get everything flat and level. Tinting, or staining after sanding had issues with bleeding into the surrounding wood. I think there are plenty of different colors, textures, and patterns without stains and dyes. I would like to find something that has strong blue or green in it. If you know of something or you have a technique that works for coloring the wood I’d appreciate any tips. 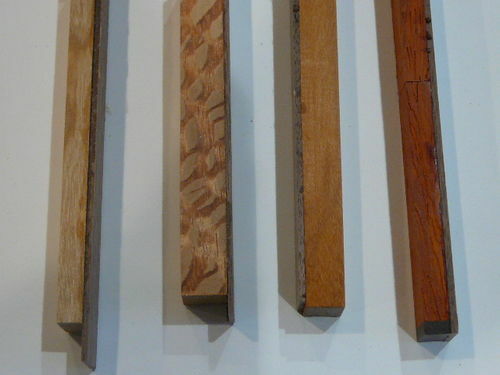 Lay out various pieces of wood and decide what wood you want to use for the various pieces. Write them on the drawing next to the pieces for reference. I use 1/2” walnut for spacers. It is a dark brown when finished and generally I have enough shorts in the scrap pile to use. Getting the shorts to 1/2” thickness usually includes some planer work, and re-sawing on the band saw or table saw. and make a 1/16” strip. 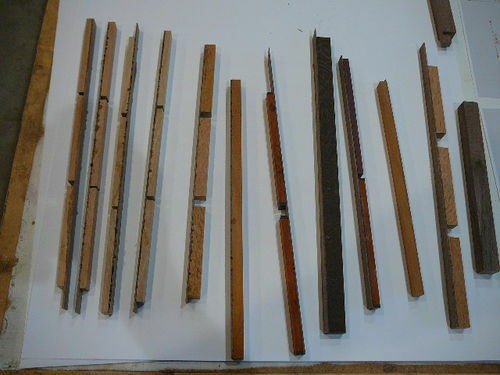 I’ll check the thickness from strip to strip and along the length to make sure I’m getting consistent thickness. Yes it is a lot of waste but consistent thickness is important to keep things straight when gluing. Cut plenty of them. See the pile of them on the right side of the wood picture. After the spacers are cut it is time to start on the pieces that make up the design. Most of the pieces are going to be narrow and probably short as well. 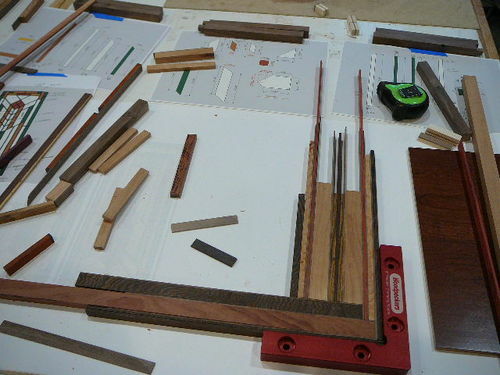 Rather than cut each piece and then glue the walnut spacers to them, cut strips off the various boards that are the width of the pieces they will be used for. 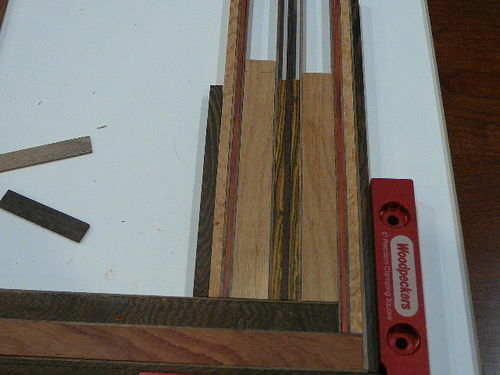 Make a sandwich out of the strips of wood and spacers to match the layout of the design. 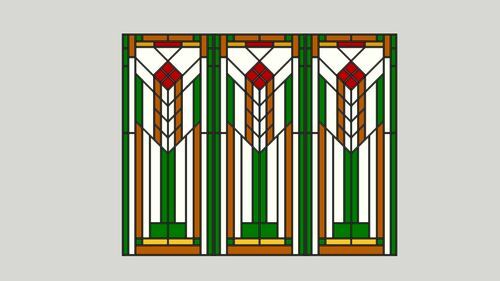 For this design, there are 3 panels and the left and right sides of each panel are identical. The pieces below the diagonal line will make up one “sandwich”. However, the orange piece at the bottom will not be part of the group since it extends to the other side of the design. Notice the square and all of the pieces. 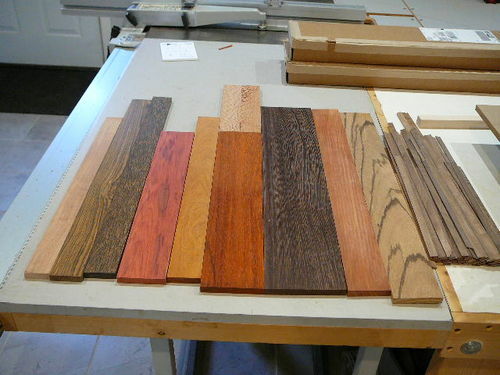 Take your time finalizing the wood selection. 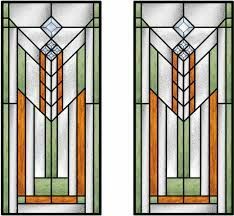 You want the wood pieces in the mosaic to highlight the design and not clash. Rather than try to glue all of the pieces together all at once, break the group into smaller sections, the orange and white pieces, and the green and white pieces. Glue each of these sub groups together with a walnut spacer between them. 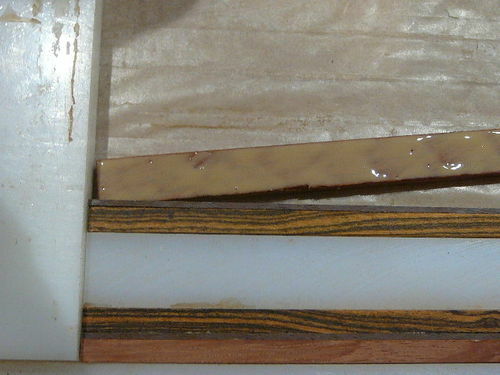 At the same time, glue a spacer along one edge of the strip that was cut for the green square. Do the same thing for the horizontal yellow piece. All of this will make the cutting and final assembly easier and more consistent. clamps – probably excessive but you want firm pressure on top to keep everything flat and you want good squeeze pressure too. 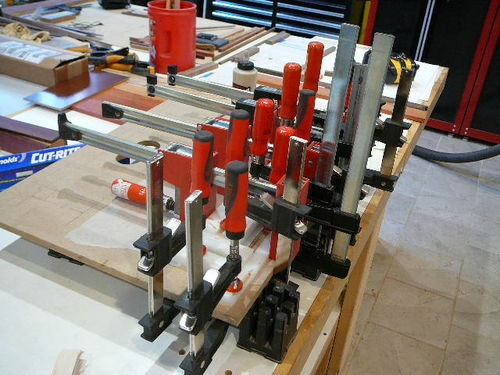 You can never have too many clamps!! The pieces stay in the clamps for at least 3-4 hours. Since I was gluing spacers to some left over pieces there are spaces between them. 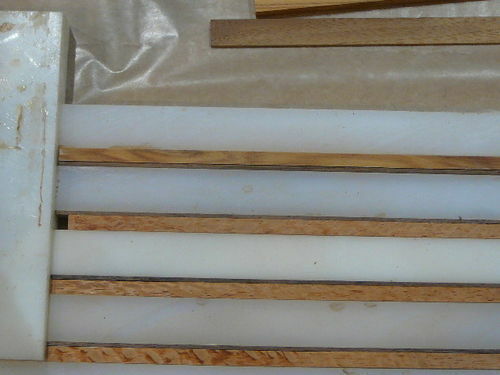 The individual pieces will be cut to length later. Since the walnut is glued on the piece it will be perfectly trimmed as well. I prefer to glue spacers to longer pieces and then cut them to length. Close-up – there is some squeeze out. Knock any high spots off the tops and run a sanding block down the sides to clean up an glue there as well. The next post will discuss assembly of the “sub sandwiches” and thoughts on how to safely and consistently cut the pieces. It will be a few weeks until then. Those darn summer chores are getting in the way of woodworking. Please post thoughts, suggestions, ideas, questions you have. I’m always looking for a better way to do things and this is definitely an evolving process. Excellent tutorial on building up the mosaics, Earl. Using hand tools, I resaw things thick (mostly 3/8” to get to 1/4” final thickness) and then sneak up on my knifed thickness lines by planing the edge down. I have one plane set up to take about 1/100” per plane pass pretty reliably, meaning three passes is pretty darned close to 1/32”. I use that technique for all sorts of things. Fitting the bottom into a box, making all the sides close to the same height, or building a sandwich of scraps to make knife scales. I’ve been pretty happy with the TransTint dyes, but I’m still learning what does and doesn’t work with them. I think Paul (shipwright) has a post about them in one of his marquetry posts that I plan to read next time I’m going to try dyeing wood. Art – The Inlace is interesting. Have you used it? I hadn’t really thought about something like that. I’ll have to make a project where I can specifically use it. After this box, I still have another partially finished walnut box that my wife wants me to make into a silverware chest. Might be the perfect project to try this. thank you for nice write-up. I am really appreciate this! Super nice how2 and project and I was thinking some poplar has a green tint but as I found out on my caboose the green very quickly turns a nice shade of brown so not a good choice. Earl, I haven’t used it. I looked at it when I made this table, but decided it wasn’t needed. Still, I like the way it looks and wish I had a project where I could try it.